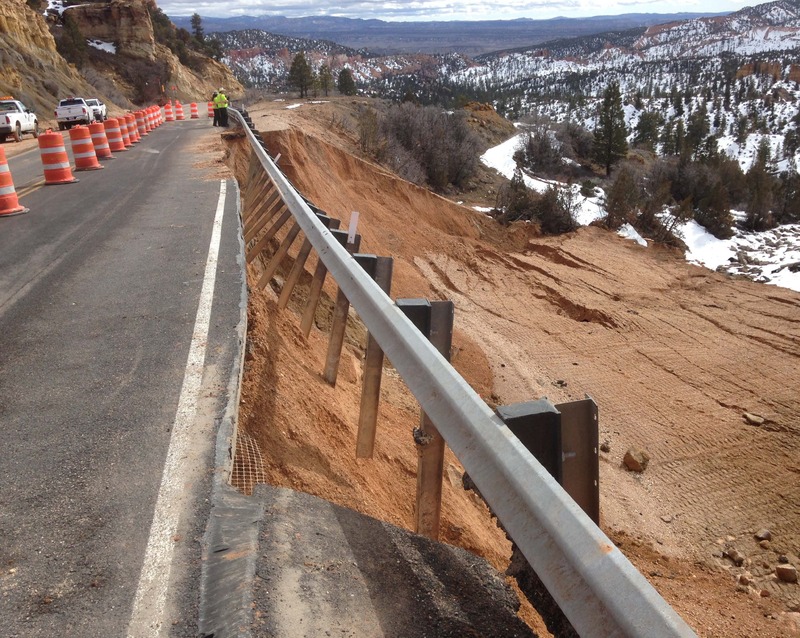 ST. GEORGE — A landslide on state Route 12 leading into Bryce Canyon National Park has created road construction projected to possibly last into the summer season as crews work to repair the road. Nonetheless, 80 percent of traffic into the national park is unaffected. The Feb. 24 landslide took out a large chunk of the eastbound lane on the scenic byway between mileposts 14 and 15, causing traffic to be restricted to a single lane managed by traffic lights. Delay times average three to five minutes. “Eighty percent of the traffic that goes into Bryce Canyon National Park is not affected because as you know the dump is on the east side of the main entrance to Bryce Canyon National Park,” Ron Harris of Ruby’s Inn in Bryce Canyon texted St. George News. In the meantime, the park service is working with the Utah Department of Transportation to investigate the cause of the landslide. The highway shoulder first showed signs of sagging over a week before falling away completely. “While our mission binds us to the preservation and protection of the unique resources of Bryce Canyon National Park, we share a commitment with the Utah Department of Transportation to address this issue in the most effective way possible,” Interim Park Superintendent Sue Fritzke said in a news release. UDOT is continuously monitoring the road for movement and has worked quickly to prevent further road damage. The park’s unique geology is among the reasons for the landslide. Soft, soluble layers of rock formation and silty limestone present a challenging landscape for engineers. The same portion of SR-12 has been the subject of geological fragility in the past. “What is important is not just restoring traffic to normal, but doing so in a way that will last,” Fritzke said. Currently, the park and UDOT are working together to come up with a new solution to the issue. Travel updates will be posted through the park’s Twitter account @BryceCanyonNPS as well as its Facebook page. Additional information about the park can be obtained at www.nps.gov/brca or by calling the park’s information line at (435) 834-5322. Updated March 9, 2017 – Input from Harris added.